“While we’re living there’s always hope” (Talmud). To you, it might seem obvious that life equals hope, but such wisdom is found in Talmud and affirms our Jewish outlook. We learn that life, itself, is a blessing. There is no original sin in Judaism from which we have to be cleansed. We were not conceived in sin, nor were we created with sin. In Judaism, life begins as a blessing. Our only obligation is to thrive in this world to make a positive difference while we’re here. Torah teaches, “Choose Life!” (Deuteronomy). We were created with extraordinary power to choose. No matter the circumstances placed before us, we hold the power to choose how to address them. Remember the song, “It’s my party and I’ll cry if I want to”? In the midst of joy there are those who refuse to be happy. In the midst of tragedy there are those who feel delight rather than sorrow. We’re not supposed to repress feelings or pervert them into something that they’re not. We’re commanded to feel all of life’s moments and find meaning in them. 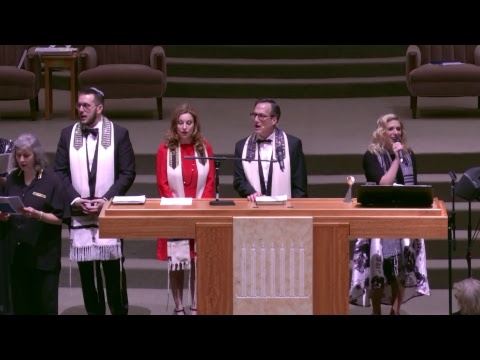 When a young man was called to the Torah as a bar mitzvah in his 30’s, it was a moment celebrated by him and his family with his rabbis and cantor. Though some might ask why he did it, it wasn’t a question that required an answer. It was a moment he chose to create long after his 13th birthday passed. For him, he chose life when he recognized the opportunity before him and he mastered it with understanding and joy. This past week, I officiated at a funeral. We mourned the death of a beloved personality, but after experiencing grief it will become our obligation to honor his life with our own. There will always be those who fail to truly live after a loved one dies; but, that’s not what we’re commanded to do. The mitzvah to mourn should be followed by the mitzvah to “Choose Life!” again. “While we’re living there’s always hope” is especially poignant in the hospital. Too often I’m asked if all is lost or if there’s anything more to do. I’m not a doctor, so I can’t honestly answer questions that require a scientific or therapeutic reply. I’m a rabbi, so I can say that while the patient is alive, there’s always hope. We find hope in the doctor’s insights and dedication; and, we find hope in prayers that God’s presence will guide the hands of those who help in healing. On 9/11, stranded workers in the Towers believed they had no choice but to jump from more than 90 floors above the ground. I don’t believe they jumped because they wanted to die. I believe they jumped because it was their only hope. They jumped because it was a choice to live if by some means they might be spared the terrible and ultimate fall. Our profound sorrow is that there was no probable outcome that they would be spared. The height was too great and 9/11 would be remembered for its unfathomable pain and loss. Though their choice was agonizing, the victims of 9/11 demonstrated their will to live and their power to choose. Today, one of the greatest tragedies in our country is the rising suicide rate. Among veterans the suicide rate is higher than the general population. Ending one’s life under the impression that no other choice exists is always tragic, but it’s also mostly preventable. From where does such human despair begin that the only choice that remains is to end one’s life and with it the possibility of hope? Does it begin at home where we reward success and punish failure? Does it happen because we’re reared to be rising-stars and made to fear anything less as signs of weakness and disappointment? Does it grow out of a lack of awareness of faith in God? Not perfect faith, but hope that begins in Torah where feeling commanded by a Commander who implants within us reasons to choose life might stem the tide of increasing numbers of people who stand on the brink everyday. “While we’re living, there’s always hope.” Make it your mantra this week. Share it with others who might need to be reminded. In joy and sorrow, alike, we can find meaning. From meaning, we can choose wisely. May our days be filled with choices that lead us to greater joy in living a life of peace.